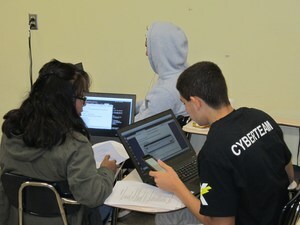 Cyber Security team makes regional competition! Out of 1885 teams, our 2 Cyber Security teams advanced to the regional competition. They will secure operating systems such as Windows 7, Windows 10, Ubuntu, Windows Server 2016 and Cisco Networking in a 6 hour competition. May the digital force be with Linda, Lauren, Isaac, Amy, Esther, John Paul, Sifath and Tom!